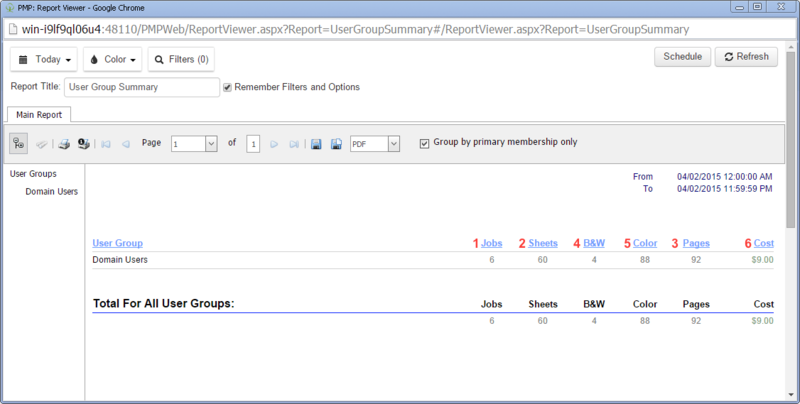 Our summary reports show a summary of all print jobs and then a total for specific data objects in Print Manager Plus, Work Groups, Active Directory and Ldap. Below are the definitions of the data you are looking at and a graphic. Jobs – Number of print jobs. Sheets – Number of sheets of actual paper used in a print job. Pages – Number of pages printed on including duplex (back and front of the sheet of paper) and copies. B&W – Number of pages (including copies) printed on in Black toner. Color – Number of pages (including copies) printed on using color toner.